In recent years, the 49ers haven’t been big players in free agency. It’s obvious that era is over. On Wednesday and early Thursday, the 49ers moved swiftly to address a number of deficiencies. Armed with plenty of salary-cap room, new general manager John Lynch and head coach Kyle Shanahan on Wednesday were able to get signing agreements with quarterback Brian Hoyer, wide receiver Pierre Garcon and fullback Kyle Juszczyk. They could sign deals with the team after 1 p.m. Thursday, the official opening of the annual free-agent period. The 49ers have followed up by agreeing to terms with Buffalo wide receiver Marquise Goodwin and Oakland linebacker Malcolm Smith. The addition of Smith should be a good fit. New defensive coordinator Robert Saleh intends to install a defensive scheme similar to the one used by the Seattle Seahawks, where Saleh was an assistant coach before going to the Jacksonville Jaguars. Smith, a former Seahawk, knows that system and thrived in it before going to Oakland two seasons ago. Matt Barrows of the Sacramento Bee reports Smith will likely play on the outside when the team is in its base 4-3 alignment. He notes Smith will compete with Ray-Ray Armstrong for the job at weakside linebacker. Smith has good speed and range, qualities prized in Saleh’s system. The past two seasons in Oakland, Smith had 122 and 103 tackles. 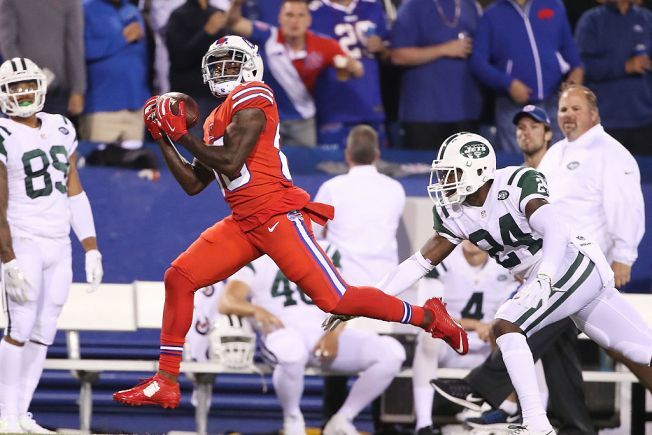 Goodwin is a 5-foot-9 speedster who was a third-round pick out of Texas by the Bills in 2013. He’s never had great success and has played a secondary role with the Bills. But he’s coming off his biggest season in 2016, when he had 29 catches for 431 yards and three touchdowns. He has just 49 catches in four seasons, but has played only 39 games because of injuries. As Nick Wagoner of ESPN wrote, Goodwin has terrific speed – he ran a 4.27-yard 40-yard dash at the NFL Combine in 2013 – and could play a specific and special role in Shanahan’s offense, much as Taylor Gabriel did in Atlanta this past season under Shanahan. Gabriel, also a small, fast wideout (5-foot-8) had 49 catches in 2016 for 579 yards and six touchdowns. Goodwin could rank as one of the best athletes in the NFL. He has competed for the U.S. in the long jump at the 2012 Olympics and is a two-time NCAA champion in that event. He’s also been a sprinter and triple jumper.